Cynthia Reyes has done it again. 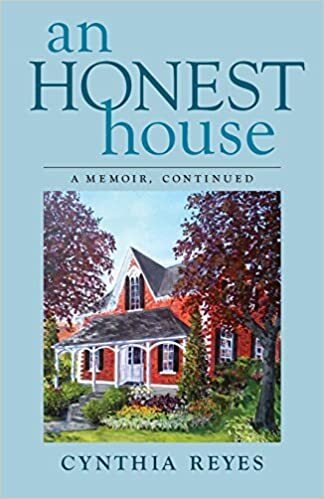 Picking up from the early days of her recovery from a car accident, as told in her first book, “A Good Home,” she shares in this new book intensely lyrical stories of life with her husband in their historic farmhouse north of Toronto. You will hear the birds sing, smell the flowers in their lavish gardens, and taste the red currant jelly and other dishes from plants grown on their property. You will be challenged as the author immerses you in the reality of post-traumatic stress disorder, depression, and the courage it takes to live with chronic pain. And you will say a wrenching farewell to the farmhouse as she opens a new chapter in a life still devoted to creating beauty out of the materials that life serves up to her, be they dark and haunting or light and joyful. This elegant memoir is beautifully written, full of heart, humor and joy in the ordinary days and things of life. In the aftermath of a traumatic auto-accident which left her full of pain, stress, and discouragement, Cynthia Reyes has learned, little by little, through love, and the beauty that surrounds her, that one can indeed re-imagine the universe. There is no wallowing in suffering here, but a frank confronting and entering that dark tunnel and coming out to the other side. Reading this is like reading the best personal journals, full of soul. It is a work of fresh air and light; it will leave you not only hoping, but believing that life is good. Did I say humor? There’s plenty of that, too, and it’s a delight! An Honest House is honestly wonderful. Cynthia Reyes’ second memoir (Part II of A Good Home) is captivating and poignant. I already knew I’d like it because I read and loved her first memoir, and I’m already a fan of her blog. But what I didn’t expect was how deep she’d dig into her inkwell for this from the heart sequel. She unveils more about her tragic car accident, her serious injuries, and her struggling but growing faith. I don’t want to give anything away in this review, but I will say that it surpassed my expectations of what I’ve come to appreciate in memoirs. 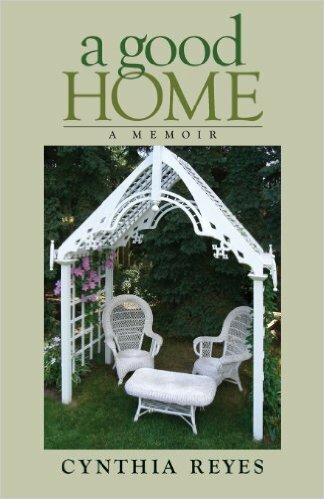 She sets the table with delicious descriptions of her heritage home, friendships, and gardens as she wrote her way into my mind and heart, so that I walked with her through the pages of her story. When she laughed, I did. And when she cried, I cried too. It’s not a book to be read in public if you’re easily embarrassed to burst into laughter or tears in front of strangers. But if you desire to grow in your understanding and empathy towards those who’ve walked the PTSD multi-lane-highway, this is the book to board. My only regret was reaching the last page and wanting more (just like the last time). I have no hesitation giving this a five star bouquet of beautiful roses. And nothing would please me more than to find out there will be a Part III. This book is masterfully written. It is a continuation of her first book “A Good Home”, but you don’t have to read that to enjoy this one. She hooked me with the first page when she talked about the house as if it had its own personality and character. The house and yard were one of the constants through her struggle to recover from an accident. Sometimes the house helped, sometimes not. Her husband was another part of the constant in her life and this book is part love story. Cynthia doesn’t clean things up for the readers, but gives an honest look into the struggles and difficulties she has had to deal with. She doesn’t give a three step path for overcoming, but rather a day to day encouragement to keep going in spite of where you find yourself. Her ability to involve herself in the lives of others, even while facing such struggles herself, was inspiring. I would highly recommend it for anyone who wants to understand the day to day struggle of someone with PTSD. I would also highly recommend it as an excellent memoir that sweeps you away into her life. Her first book I read in a weekend. This one I took longer, just because I wanted it to last. Not everything is resolved, so I hope to see another book down the road. I first fell in love with Cynthia Reyes’ writing while reading “The Little Pink House’, an article published in the Globe and Mail (Canada’s national newspaper). I was so moved by this lovely story that I was prompted to write the paper to share my thanks to her for writing it and to the paper for sharing it. I was delighted to find out months later, that a whole book was on the way (“A Good Home’) and that the pink house was an integral part of that book. I read ‘A Good Home’ in only two sittings and was very sad to leave the world that Cynthia shared with us. 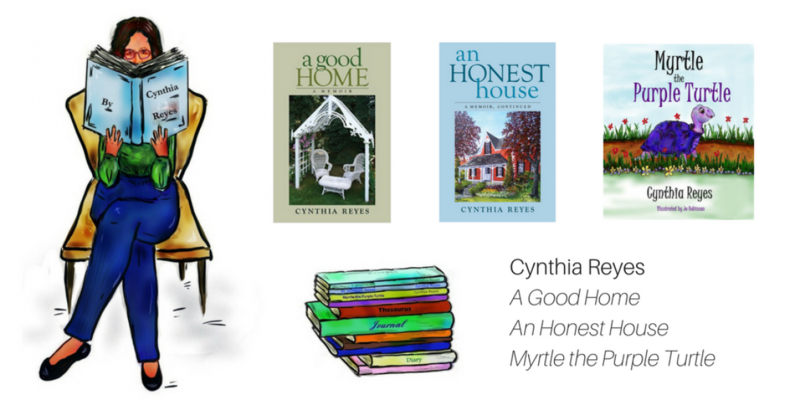 Happily for her readers, Cynthia invites us back into her home with the second installment of her memoir ‘An Honest House’. Imagine visiting dear friends that invite you inside their home, offer you a pair of comfy slippers and a cup of your favorite beverage… You feel completely at home here, both a privileged friend and a member of the family. When it is time for you to leave, you are sad to go, but take the memory with you of that time so well-spent and enjoyed. This is how I feel when I read Cynthia Reyes. Which is extraordinary, because her books, which are so easy to read because they are so inviting and engaging, are also subtly complex.There is also great humour in these chapters, some of which had me laughing out loud. The pain and frustrations, delight in the everyday, joy and successes are interwoven with each other in Cynthia’s chronicle to create a richness of storytelling that I find so compelling and satisfying. Reading her passages is like watching a great movie (or reading great fiction). The story is so compelling and interesting and the writing flows so nicely that I get caught right up in it and don’t realize that I have completely left my own world until I finish the last page and look up.